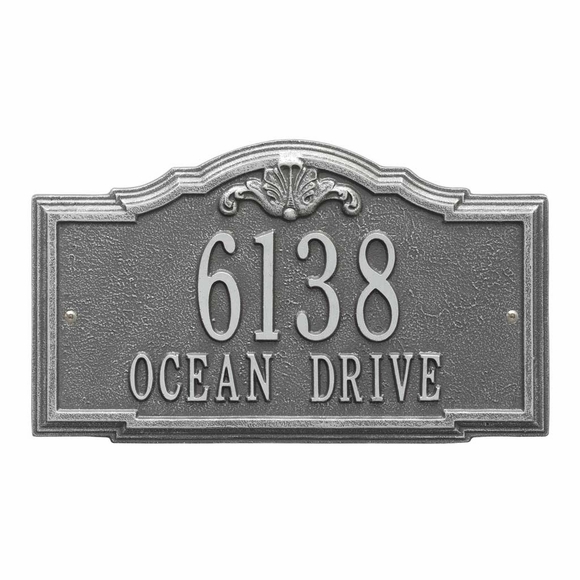 Gatewood 2 Line Address Plaque - - with house number and street name. Traditional styling. 15.75x10 plaque available for wall mount or lawn mount. Made in USA. Line 1 (for house number) holds up to five (5) 4" characters. Line 2 (for street name) holds up to seventeen (17) 1.25" characters. NOTE: Street name always comes in all capital letters, as shown in the samples, using the exact spelling you type into the input box. PS pewter with silver characters (shown in large image). Small images from left to right: AC antique copper; BG black with gold characters; BS black with silver characters; BV bronze verde; OB oil rubbed bronze; and OG bronze with gold characters. To purchase the one-line version of this sign without the street name, click top link in Related Products.